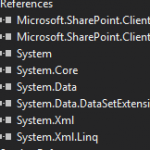 Sometimes you need to make some not common things with data in SharePoint site. Today one girl asked me if I can modify date of creation or modification date of a file in document library. Of course, there can be other cases, for example, you need to save creation date information for data in migration process. I'm trying to remove all permissions from a list item in SharePoint 2010. There was a lot of permissions because of the "Limited access". I couldn't check all items because of the constraint of maximum selected items. This script is 100% compatible with SharePoint 2013 and SharePoint 2016. I used Advanced Workflow Actions for SharePoint Designer 2010 from iLoveSharePoint for Workflows in SharePoint site. And one of used by me activities was "Execute PowerShell Script Action". While removing Site Content Type you got the error that "The content type "My Content Type" is part of an application feature". The fix is rather easy and simple.